One of the missing Chibok schoolgirls has been found in Nigeria, the first to be rescued since their capture two years ago. 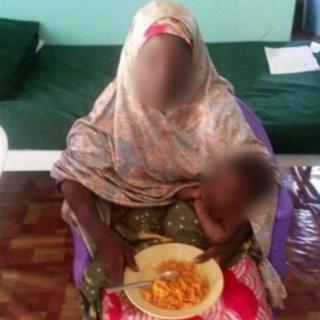 Amina Ali Nkeki was found carrying a baby by an army-backed vigilante group on Tuesday in the huge Sambisa Forest, close to the border with Cameroon. She was with a suspected member of the Boko Haram Islamist group. The girls were taken by militants from Boko Haram. Amina, now 19, was reportedly recognised by a civilian fighter of the Civilian Joint Task Force (JTF), a vigilante group set up to help fight Boko Haram, and briefly reunited with her mother. The Nigerian military named the suspected Boko Haram fighter as Mohammed Hayatu. He said he was Amina's husband. He has been arrested and taken to the regional capital Maiduguri, along with Amina and her baby, for medical attention, the military said. "The moment this girl was discovered by our vigilantes, she was brought to my house. I instantly recognised her, and insisted we should take her to her parents. "When we arrived at the house... I asked the mother to come and identify someone. The moment she saw her, she shouted her name: 'Amina, Amina!' She gave her the biggest hug ever, as if they were going to roll on the ground, we had to stabilise them. Afterwards, we had to make them understand that the girl would not be left in their care. She must be handed over to the authority." Hosea Abana Tsambido, the chairman of the Chibok community in the capital, Abuja, told the BBC that Amina had been found after venturing into the forest to search for firewood. Sources told the BBC that she was from the town of Mbalala, south of Chibok, from where 25 of the kidnapped girls came. In recent days, Nigerian media reported that the army had launched operations against Boko Haram in the Sambisa Forest. Nigerian army spokesman Col Sani Usman Kuka Sheka issued a statement saying a Chibok schoolgirl was among a group of people rescued by Nigerian troops. Amina was found by a local vigilante group out on a routine patrol. These groups have played a vital role in the fight against Boko Haram. They sprang up in 2013 in the main city of north-east Nigeria, Maiduguri. It was a desperate measure at a terrible time when the jihadists were winning the war, seizing territory whilst reports of soldiers fleeing rather than fighting were common. More vigilante groups then sprang up across the north-east and, with local knowledge of the terrain, they had some success stopping their homes from being taken over - even though they were armed just with rudimentary weapons. As the Nigerian military started getting its act together at the beginning of 2015 with help from outside, it started retaking territory and in some areas worked effectively with the vigilantes. There is, however, great concern that as peace returns the vigilantes - who have tasted power - pose a danger themselves. During the 2014 attack, the gunmen arrived in Chibok late at night, then raided the school dormitories and loaded 276 girls on to trucks. Some managed to escape within hours, mostly by jumping off the lorries and running off into roadside bushes. In total, 219 girls remained missing before this latest news. A video broadcast by CNN in April this year appeared to show some of the kidnapped schoolgirls alive. Fifteen girls in black robes were pictured. They said they were being treated well but wanted to be with their families. The video was allegedly shot on Christmas Day 2015 and some of the girls were identified by their parents. The Chibok schoolgirls, many of whom are Christian, had previously not been seen since May 2014, when Boko Haram released a video of about 130 of them gathered together reciting the Koran. The abduction led to the #BringBackOurGirls campaign, that was supported by US First Lady Michelle Obama and Pakistani activist Malala Yousafzai.